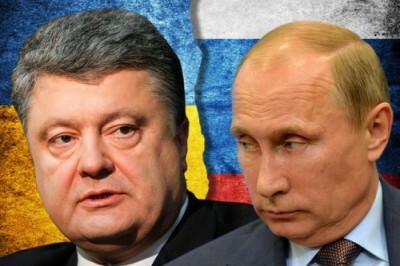 In an inflammatory statement to the BBC yesterday, Ukrainian President Petro Poroshenko declared that his regime, which enjoys political and military support from Washington and the European Union (EU), is at war with Russia. “Can I be absolutely clear with you, this is not a fight with Russian-backed separatists, this is a real war with Russia,” Poroshenko said. He added that he expected renewed fighting in regions of east Ukraine held by pro-Russian separatist forces in the coming days. Poroshenko dismissed speculation that, after US Secretary of State John Kerry’s trip to Moscow last week, relations between Washington and the Kremlin might improve, and that the US government might therefore limit its support to his regime in Kiev. Poroshenko’s remarks point again to the utter recklessness of Washington and its EU allies in Ukraine. The installation of a pro-NATO government in Kiev last year, in a Western-backed putsch led by the fascist Right Sector militia, was designed to turn Ukraine into a NATO military outpost pointed at the heart of European Russia. The putsch plunged regions of east Ukraine economically and culturally tied to Russia into civil war and set the entire world on the verge of war between NATO and Russia, which both have nuclear arsenals capable of destroying the planet. In a speech earlier this year, Russian President Vladimir Putin revealed that the Kremlin feared last year that NATO would launch all-out war over the Ukraine crisis, and put its military, including its nuclear arsenal, on a heightened state of alert. Poroshenko’s provocative talk of war, which he no doubt discussed with operatives in Washington as closely as Kerry’s talking points in Moscow, fuels these explosive military tensions. It also strengthens the hand of Washington, as it presses all the EU powers to continue a hard-line policy against Russia despite the rising economic damage to Europe from EU financial sanctions that are cutting off European-Russian trade. Officials in France and Italy are reportedly proposing to scale back the sanctions, citing “progress” since the Minsk peace talks in February and a lessening of the danger of war. To justify his statement that Ukraine and Russia are at war, Poroshenko pointed to the recent capture of two Russian special forces soldiers, identified as Captain Yevgeny Yerofeyev and Sergeant Alexander Alexandrov, in east Ukraine. The Kremlin has denied that Yerofeyev and Alexandrov were on active duty, however. While this confirms the widely suspected fact that Russian forces are backing the pro-Russian separatists in east Ukraine to prevent a catastrophic defeat by the Ukrainian army and allied fascist militias like Right Sector, it does not prove Poroshenko’s claim that Russia is at war with Ukraine. If such a war broke out, the Russian army would rapidly crush its far weaker Ukrainian counterpart, absent a military intervention by NATO and the eruption of a global war. It confirms rather that the reckless decision by the NATO powers to back a putsch in Kiev has led to a civil war in Ukraine that has escalated into a dangerous proxy war between Russia and NATO. Russia has limited itself to offering tacit backing to the east Ukrainian separatists, and US-allied intelligence agencies in Europe have formally contested claims that the Russian army is preparing to invade Ukraine. Poroshenko’s interview is part of an ongoing attempt to cultivate a narrow layer of fascistic, anti-Russian forces inside Ukraine as a social base for his regime, amid rising popular opposition to the war in east Ukraine and the resulting economic collapse. Ukraine’s economy fell a stunning 17.6 percent between the first quarter of 2014 and the same period of 2015, with output in the Donetsk and Luhansk regions—the war-torn areas of east Ukraine that are the country’s industrial heartland—falling 30 to 40 percent. Industrial supply chains in Ukraine, which are closely linked to Russia, have been thoroughly disrupted by months of fighting that have claimed thousands of lives and forced millions to flee their homes. The Ukrainian government’s debt has soared from 41 percent to 73 percent of the country’s Gross Domestic Product (GDP). Ukraine’s foreign creditors, led by US asset management firm Franklin Templeton, are refusing to allow a write-down of the country’s debt, however. The Ukrzaliznytsya public sector rail network defaulted on its domestic debt last week. Living standards have plunged as the collapse of the hryvnia, the Ukrainian currency, helped fuel inflation of 60.9 percent, and masses of people were thrown out of work by the Kiev regime’s mass sackings of public sector workers and its elimination of subsidies for the coal industry. There have been numerous social protests in western Ukraine and also large-scale draft dodging, in the face of the Kiev regime’s attempts to conscript more men to fight in eastern Ukraine. The Kiev regime is responding by furiously promoting the far-right forces that brought it to power last year, as well as their political ancestors—the Ukrainian fascist forces that collaborated with the Nazi invasion of the USSR and the extermination of the Jews in Ukraine during World War II. Last week, Poroshenko signed into law a bill banning reference to communism or Ukraine’s Soviet past and honoring Ukrainian fascist groups such as the Organization of Ukrainian Nationalists (OUN) and the Ukrainian Insurgent Army (UPA) as freedom fighters. Asked by the BBC about the role of far-right forces in supporting his regime, Poroshenko initially dismissed any such claim as “Russian propaganda.” Pressed by the interviewer to comment on the role specifically of Right Sector and of the Azov Battalion, Poroshenko said that given the spread of far-right forces such as the National Front in France or the UK Independence Party in Britain, he did not think the Ukrainian far right posed a danger. “They are active in France, they are active in UK, they are active in Austria, in some European countries…I understand responsibility, and I guarantee that Ukraine will keep a democratic tradition,” he said. In fact, the Kiev regime’s inflammatory statements on war with Russia and its promotion of the legacy of 20th century fascism underscore the utter fraudulence of its Western backers’ claims that their intervention in Ukraine is aimed at defending democracy or freedom.